Windows 8 Start screen enables users to group and name Windows 8 tiles to take control and manage them easily. When you install a new app from Windows store or install a new software on your Windows 8 PC, a new Windows 8 tile is added on Start screen. This tile is a short-cut to launch the Windows 8 apps or programs from Start screen. 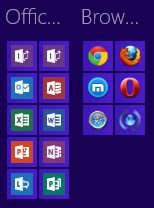 On the bottom-left corner of your Windows 8 Start screen, there is a minimize button like minus sign on top-right corner of windows applications. If you click on this minimize button or minimize icon, all Windows 8 tiles taking place on your Start screen will be shown in one screen in smaller dimensions. 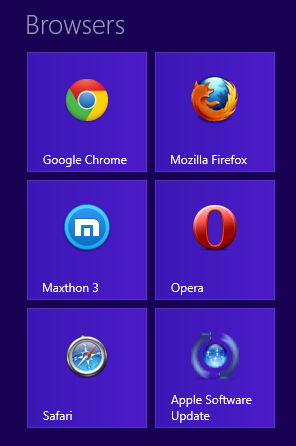 This minimized view of tiles on Windows 8 Start screen will enable users to have a broad view of all apps and programs' tiles. It is also easy to tile groups in this minimized view of Start screen. When you move the mouse over the tile groups, the group border will be highlighted. You can right click on the group are. When you right click, a check mark will be shown as below within the area of that Windows 8 tile group. At the same time a ribbon menu will be automatically displayed at the bottom of the screen. This menu includes Name group command option and All apps command button. 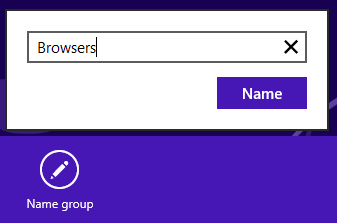 Click on the Name group button to give a descriptive short name to the selected Windows 8 tiles group. In the input textbox area, type a short yet descriptive name for your tiles group that is shown on Windows 8 Start screen. After you provide description for your tiles group, press or tap on Name button to complete naming task. Press or tap any where to switch to normal Start screen view. And here is how the group name is shown on normal view of your Start screen. 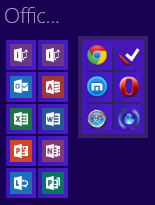 I believe this short Windows 8 tutorial will help users to get used to new Windows 8 Start screen controls and help users to take tiles into control by grouping and naming them. Windows 8 Setup Error: HAL_INITIALIZATION FAILED. Your PC ran into a problem that it couldn’t handle, and now it needs to restart.